British MP George Galloway made a surprising visit to the United States last week to raise money for a planned fourth Viva Palestina (VP) convoy. Galloway's group claims to "break the crippling siege of Gaza and deliver humanitarian aid" to Palestinians, but statements and actions on past trips show it also seeks to support the terrorist organization Hamas materially and politically. Galloway made his first public appearance in the U.S. since last summer on January 30th at a fundraising event in New Jersey hosted by American Muslims for Palestine (AMP). Introduced by the emcee as "our hero," Galloway urged the audience to "give more" than they already had donated, and said, "I encourage you, go into debt. You're in debt already anyways." 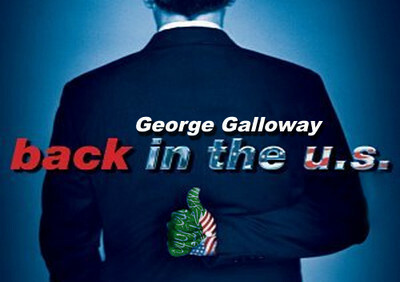 The next day, Galloway spoke in Brooklyn at an event hosted by Al-Awda NY:The Palestine Right to Return Coalition. Then, on Monday he spoke at the Palestinian Cultural Center for Peace. Galloway used these engagements to raise money and advocate his political agenda. He repeatedly slammed Egyptian President Hosni Mubarak for its "tin pot tyranny" and declared, "Shame on the regime of Hosni Mubarak." Galloway was deported by Egypt on January 8th and declared "persona non grata" by the Egyptian foreign ministry, barring him from entering the country again. This came after clashes arose at the El-Arish port between Viva Palestina 3 convoy members and the Egyptian police after members ripped off one of the gates of the port, resulting in the arrest of seven VP members and the death of an Egyptian soldier shot by Hamas militants. Galloway didn't reference those theories, choosing instead to boast that Chavez planned to lead the next Viva Palestina convoy before Egypt's ban: "And for some reason…Hosni Mubarak didn't fancy Hugo Chavez being in Egypt. Who knows what would have happened? The people may have risen up and installed Chavez as the president of the Arab Republic of Egypt." For all his bluster, Galloway seemed defensive during last week's fund raisers. He referred to "the FBI man in the room" declaring that "We're not involved in terrorist funding," and "I have never been a supporter of Hamas." The Investigative Project on Terrorism has previously documented evidence to the contrary, showing that Galloway and Viva Palestina have raised money for Hamas and supported the organization in its rhetoric. In addition, the Voice of Palestine, a news agency run by Fatah (the governing Palestinian body in the West Bank), reported last month that Hamas leaders were fighting for control over $1 million Hamas leader Ismail Haniyeh received from Viva Palestina. The article, "al Ja'abri Bursts Into Haniyeh's Office and Steals Documents and Files Concerning Huge Amounts of Money," describes how Ahmad al Ja'abari, the head of the Hamas military wing – "removed $600,000" of the money from Haniyeh's office while leaving the rest for Haniyeh. Previously, Palestinian Authority President Mahmoud Abbas called the VP convoy a "propaganda tool" for Hamas. The first Viva Palestina convoy, a UK initiative which arrived in Gaza in March 2009, directly gave £1 million (approximately $1.4 million U.S.) to Ziad al Zaza, the Economy Minister of the Hamas government, as well as thousands of British pounds of aid and tens of vehicles to the Hamas. In Gaza, Galloway stated "I personally am about to break the sanctions on the elected government of Palestine…" because, "[We] are giving three cars and £25,000 cash to Prime Minister Ismail Haniyeh. Here is the money. This is not charity. This is politics. The government of Palestine is the best people where this money is needed. We are giving this money now to the government of Palestine." Since VP-USA has no corporate status, it raised money for the last two convoys through online donations, with all funds handled by IFCO, a 501(c)(3) entity that serves as a conduit for contributions. VP-USA had more than 20 fund raisers throughout the country between April and June 2009 to fund the second convoy, a U.S. endeavor, which left New York on July 4. Galloway spoke at most of the events. VP-USA claimed that funds raised for the second convoy were given to an NGO in Gaza called Expertise in Consulting and Development (CODE), an organization which receives significant funding from the Union of the Good, designated by the U.S. Department of Treasury in 2008 as "an organization created by Hamas leadership to transfer funds to the terrorist organization." Galloway's latest trip to Gaza with Viva Palestina was not his last contact with leaders of terrorist groups. Following Viva Palestina Convoy 3, Galloway spent time in Beirut, where he participated in a conference titled "Arab International Forum for the Support of the Resistance," held January 15-17, 2010. Galloway spoke alongside Islamists, including Hezbollah leader Hassan Nasrallah and Hamas leader Khaled Meshaal, who stated "his total support for the resistance, and thanked Iran for the support it has been giving." Speaking at the conference, Layla Khaled of the Popular Front for the Liberation of Palestine, expressed the need for more suicide bombing attacks in Israel: "'This world needs a bomb explosion so the people could listen', she added, referring to the operations done by the Palestinian resistance confronting the Zionist enemy, which says that the Resistance are the terrorists, which in reality, "Israel" is terrorism its self." At a banquet held in Amman in late January, Muslim Brotherhood leader Hamam Saeed "praised participants in the Lifeline 3 convoy, describing them as 'Mujahideen.'" Questions about Viva Palestina's Hamas support have grown throughout the past year, making it somewhat surprising that Galloway was allowed to return to the United States to raise more money for Viva Palestina. The Canadian government banned Galloway from entering the country last March, citing his actions in supporting Hamas, a decision he is fighting in court. Galloway and Viva Palestina's actions have generated attention among members of the United States Congress and University of California officials. Last fall, the University of California,- Irvine (UCI) forwarded a complaint to the Federal Bureau of Investigation about a Viva Palestina fundraising event sponsored by UCI's Muslim Student Union in May 2009, because of university officials' concerns that funds raised on campus were transferred to a terrorist organization. U.S. Rep. Brad Sherman (D-CA) urged the Justice Department, the IRS and the Secretary of State to investigate whether Viva Palestina is raising money for Hamas in December, 2009. In January, 2010, in a letter sent to Treasury Secretary Timothy Geithner, Congresswoman Sue Myrick (R-NC) stated that the U.S. Treasury Department should designate Viva Palestina under Executive Order 13224 for providing "material support" to Hamas. Despite the calls for investigations, the convoys' open support for Hamas and reports that Hamas officials are fighting over the money left behind, Galloway and Viva Palestina defiantly plan a fourth convoy to arrive in Gaza in spring. In Boston, Galloway was met with a crowd of about 35 protestors of all faiths who sang, chanted and shouted beore and during his presentation. Not enough, but a start.